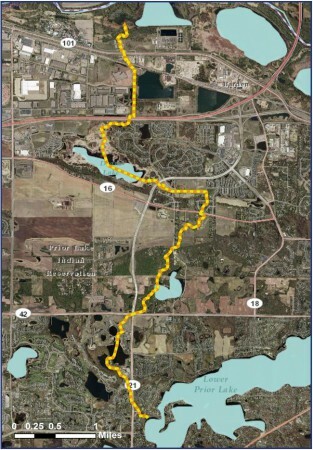 In 1973, citizens first petitioned the Prior Lake-Spring Lake Watershed District to construct a stormwater outlet from the landlocked Prior and Spring lakes. That year, a Feasibility Study concluded that a pipe outlet should be constructed as a relief valve to carry approximately 50 cubic feet per second of water downstream and that areas should be acquired and reserved for ponding purposes. Due to numerous complications, the outlet structure and outlet channel were not completed until July 1983, ten years after the initial citizen petition. Unfortunately, two, 100-year storm events occurred in March of that year, before the Channel was completed. Spring Lake Dam was sandbagged, and homes were flooded. Spring Lake Dam has only had to be sandbagged twice since then, in 1993 and 2014. The Prior Lake Outlet Channel is seven miles long. It starts at Lower Prior Lake and discharges into the Minnesota River in Shakopee. Normal wear and tear on the outlet structure resulted in cracking to the structure and diminishing efficiency. In 2007, partners and advisers developed a strategy and plan for updating the outlet system called the Multi-year Outlet and Channel Improvement Project. At that time, a Memorandum of Agreement was signed between the City of Prior Lake, the City of Shakopee, the Shakopee Mdewakanton Sioux Community, and the Prior Lake-Spring Lake Watershed District. This group of cooperators oversees the operation of the PLOC, while the District administers Channel operations. Acknowledging that the PLOC is used as a stormwater conveyance system and is not just a natural conveyance, the JPA/MOA cooperators’ focus is to manage the easements of the channel and the channel itself to maintain hydrologic capacity, reduce maintenance needs, provide long-term stability and improve water quality. Secondary benefits include increased aesthetics, providing improved habitat and providing consistency with city and county plans for parks and greenways. The outlet structure was replaced in 2010, with an accordion-shaped fixed crest weir and a low flow gate, allowing manual discharge of water between 902.0 feet (with a permit from the DNR for March-April) and 902.5 feet. June 2014 received record rainfalls, totaling 13.01 inches over 20 days, which created massive floods on Prior Lake and damaged the outlet channel. During the 2014, flood the outlet structure operated continuously. Extreme velocity and duration of flow during the flood caused unavoidable damage throughout the Channel, including over 20,000 feet of bank erosion, sediment deltas, damaged culverts, and fallen trees. Repair efforts are in Progress. More information on current and future repairs is contained within the FEMA Repairs page. Learn more about the Prior Lake Outlet Channel and the Outlet Structure on our Frequently Asked Questions page and our interactive Outlet Structure page (complete with pictures and video of the Outlet Structure!). Check out these YouTube videos from the PLSLWD mini-series: 2. Citizens Create a Watershed District & 3. The Outlet Structure for Prior Lake.